Time Needed: Tour stops 1-11 half day; 1-18 full day; all sights 2 days. No trip to Salzburg would be complete without visiting the filming locations from the hit movie The Sound of Music. The blockbuster musical from 1965 is one of the most iconic movies ever made and touring the film sights in Salzburg will remind you that hills are still very much “alive with The Sound of Music”. We hope you enjoy our free Sound of Music movie tour in Salzburg! In 1 day you can quickly breeze through Sound of Music movie locations 1-15 or even through 18 if you start early. With 2 full days in Salzburg, you can visit most of the sights on this Sound of Music movie tour and have room to mix in the Mozart attractions from our Old Town Salzburg Walking Tour. To help you better divide your time, check out our suggested itineraries for Salzburg. Most of the Sound of Music movie tour locations in Salzburg are close to Old Town so they can be seen on your own by foot without paying to join a guided tour. While you can easily walk between most of the film sights in Salzburg, we like to rent bicycles which can be as cheap as $15 bucks for the day. Turning the walking tour into a self-guided Sound of Music bike tour will make the day more magical. For movies locations further away from Salzburg, we have included the bus/train routes on our map, and current schedules can be found online here. About Mirabell Palace: Much of the song ‘Do Re Mi’ from The Sound of Music movie was filmed at the Mirabell Palace Palace Gardens. Because the grounds are open early every day, they are the perfect place to start our free Sound of Music movie tour in Salzburg. The royal palace building was completed in 1606 (rebuilt 1693) while the gardens came later in 1730. As you enter the gardens, you will recognize the two impressive pairs of Greek fencing statutes at the entrance from The Sound of Music. The figures, which were inspired the ancient Borghese gladiator statues, each leap forward with a fist triumphantly in the air. You’ll also recognize the garden’s central fountain from the ‘Do Re Mi‘ scenes of the movie. While walking through the garden’s film location sights, make sure to turn around and check out the fantastic views of Hohensalzburg Fortress towering over Salzburg that the Mirabell Palace Gardens provide. You will get many unique vantage points of the Fortress throughout this Sound of Music walking tour. Cost: Free. Garden Hours: Main Gardens are open Daily all year from Dawn to Dusk; however, the Hedge Maze and Dwarf Garden are CLOSED each Winter. Palace Hours: Monday, Wednesday, & Thursday 8am-4pm; Tuesday & Friday 1-4pm. Photos: (Entrance | Garden View | Front of Palace | Palace Interior – Staircase Angels). Sound Of Music Movie Connection: Scenes from the song “Do, Re, Mi” have the children dancing past the fountain, through the garden, and mimicking the triumphant gladiator statues. About The Pegasus Fountain & Musical Steps: On the Northwest corner of the Mirabell Palace grounds you’ll find another garden, known as the Small Parterre, which is home to the iconic Pegasus Statue Fountain (added in 1913). The Von Trapp children danced around the lip of the Pegasus Fountain in The Sound of Music movie while singing ‘Do Re Mi’. You’ll also recognize the terrace steps leading to a rose garden North of the Fountain which Maria and the kids used as a hopping musical scale. As Maria belts out the final notes of ‘Do Re Mi‘ from the top of the musical steps, she stands with her right hand high in the air like the triumphant statues from the Mirabell Palace entrance. Make sure to check out the goat-bearded unicorn statues at the base of the steps before moving on with our Sound of Music movie tour. The steps are also a great place to see the mighty High Fortress towering over Salzburg. It’s one of the best views on this free Sound of Music walking tour. Cost: Free. Garden Hours: Daily all year from Dawn to Dusk. Sound Of Music Movie Connection: During “Do, Re, Mi” the children dance around the Pegasus Fountain before hopping on the steps as musical notes in the dramatic finale of the song. About The Hedge Maze & Gnome Park: Make sure to follow the other set of steps near the Horse Fountain (opposite the Palace & guarded by lion statues) across a small footbridge to the Dwarf Gnome Park (Zwerglgarten). Each sculpture was modeled after a real-life dwarf in 1715, and there are still 15 of the original 28 statues remaining thanks to restorations in 1921. All of the figures are fun, but the dwarf wearing eyeglasses is the one that all of the Von Trapp kids patted on the head during ‘Do Re Mi’ in The Sound of Music movie. Before leaving the Mirabell Palace grounds, make sure to visit the long pergola vine tunnel and hedge maze which are also featured in The Sound of Music movie. You’ll have a great time pretending that you are Maria and the children as you hop through the ivy-laced tunnel. Personally, we have had a blast taking funny photos in the hedge maze, and it is one of our favorite stops on the Sound of Music movie walking tour in Salzburg. Cost: Free. Garden Hours: Daily 6am-Dusk; Dwarf and Hedge areas may be closed in the Winter months. Sound Of Music Movie Connection: Scenes from the song “Do, Re, Mi” including skipping down the vine tunnel and the children patting the dwarf with glasses on the head. About The Salzburg Puppet Theater: People who love The Sound of Music will know this fantastic marionette theater for having its puppets featured in the movie. In the film, Maria and the children perform “Lonely Goatherd” with the puppets on a makeshift stage in the family’s living room. This is one of our favorites scenes from The Sound of Music and it’s maybe the one song from the soundtrack that is the most difficult to get out of your head after hearing it. There are no set tour hours for the Salzburg Puppet Theater, but you can get a taste of the action in person with their great line up of live shows most days. The marionette theater also now does a full-length puppet version of the Sound of Music play a few times a week which is an extra treat. Address: Schwarzstraße 24. Show Hours: Various shows throughout the week with 4pm afternoon shows and an evening dinner show starting at 7:30pm (dinner at 6:30pm). Website & Schedule: Here. Sound Of Music Film Connection: Maria and the children perform “Lonely Goatherd” with the puppets. About Winkler Terrace: The breath-taking Winkler Terrace sits high up on Mönchsberg Hill overlooking Old Town Salzburg from a steep cliff. It was the perfect place for Maria and the children to bring the ‘Do Re Mi’ song into Salzburg from the meadow as they begin to mix the order of the musical notes up for practice. Out of all the sights on our free Sound of Music movie tour in Salzburg, this filming location by far has the best views of the town. It’s not just the views that make Winkler amazing as it is also surrounded by a timeless fortified wall called Burgerwehr which was built in 1487 to protect the city. As you work your way along the ramparts of the wall, you’ll see other defensive structures like the old Mülleggertor city gate built in 1280. Near the wall and elevator is a small cafe with decent views, but our favorite view is from M32 Cafe (Website) at the Modern Art Museum (Website). The cliff top is also home to Schloss Mönchstein (Website) & Johannes Schlössl which are beautiful castles turned hotels. If you have extra time, at least make sure to check out Schloss Mönchstein. First documented in 1350, the castle was nicknamed the Professor’s Castle when it was run by monks. Getting Up To Winkler Terrace: The most accessible way up is the Mönchsberg Elevator which sits behind the Salzburg Museum and takes you directly to Winkler Terrace. You can’t miss it as it sticks out from the cliff making is easy to see. The Elevator is only a couple Euro, is covered by the Salzburg Card, and stops running at either 7 or 9pm depending on the season. Alternatively, you can take the stairs at Toscaninihof (behind the Festival Hall) up to the top of Mönchsberg and reach the terrace with a 15-minute walk. Terrace Hours: Daily 24 Hours; elevator stops between 7-9pm. Modern Art Museum Hours: Tuesday-Sunday 10am-6pm; Wednesday 10am-8pm; Closed Mondays. Museum Cost: 8€. Photos: (View From Terrace | View From Cafe at Night | Schloss Mönchstein | Johannesschlössl). Sound Of Music Film Connection: Wonderful city views are had during “Do Re Mi” from the terrace as Maria has the children mix up the order of the musical notes. About The Horse Bath: Hugging the side of Mönchsberg Hill is one of Salzburg’s public fountains which once served as a Medieval horse bath. In the Sound of Music movie, this is where Maria and the Von Trapp kids dance around while singing ‘My Favorite Things’. The Horse Fountain’s muraled facade was added in 1693 while the Archbishop also built new Royal Horse Stables next door. We love how the cliff backdrop adds drama to any photos you take here. This horse bath is the is the larger of the two of them in Salzburg, and we will see the other later on this free Sound of Music walking tour. The baths themselves were basically car washes for horses in the Middle Ages. The 2nd horse bath is called Kapitelschwemm, dates back to 1732, and is found next to the Salzburg Cathedral in Chapter Square and is framed by two lovely willow trees. Photos: (This horse bath | The one near #8). Sound Of Music Movie Connection: Maria and the children dance past the Horse Bath in the song “My Favorite Things”. About The Rock Riding School: The Festival Hall complex is now home to performance theaters and stretches the better part of a city block tucked against Mönchsberg cliff. The Eastern end of the complex was initially a fighting arena in Roman times and later became a quarry to build local churches. In 1693, the Archbishop decided to fill the void from the quarry excavations with new Royal Horse Stables and Winter Riding School. Built partially inside a cave-like area, the well-named Rock Riding School (Felsenreitschule) became essential to Salzburg for horse training and riding competitions. It was very similar to the Spanish Riding School in Vienna in its day, just on a smaller scale. The long arcades on the Western end of the complex were later added as the Royal Summer Riding School. In 1925 the Summer Riding School was expanded to fit a performance theater called the Small Festival Hall (Kleines Festspielhaus) in time for the 1st annual Salzburg Festival. The following year huge frescoes here painted in the entrance to the Theater covering almost every square inch of the lobby. Also in 1926, the Winter Rock Riding School area was converted into a second performance theater. In the Sound of Music movie, the Rock Riding School is where Captain sings Captain performs “Edelweiss” before being joined on stage by his family for “So Long, Farewell” before escaping. The fantastic stage was also where the real-life Von Trapp Family performed before they fled the Nazis. We find this 2,000 seat theater to be the coolest in the Festival Hall complex as it incorporates a 3-story wall from the 1600s complete with 96 arched arcades as the backdrop to the stage. This wall resembles the film location’s roots as a Roman training arena when Salzburg was the settlement of Luvaum (15BC-488AD). In 1939, the Nazis had all of the beautiful frescos in the complex removed saying they were terrible art, but luckily they were re-added in their original positions during renovations in 1956. Further improvements took place in 2006 in preparation for the celebration of 250th years since Mozart was born in Salzburg. The state-of-the-art acoustics were added to the 1,500 seat theater, and it was renamed the House for Mozart (Haus für Mozart) in honor of his operas which are still featured here. The final theater, called the Great Festival Hall (Grosses Festspielhaus), didn’t open until 1960 as it required addition excavating for space. This 2,100 seat theater mainly shows Wagner productions. Even if you don’t do the theater tour or see a show, make sure to swing by Toscaninihof Square at the end of the complex where Captain waited before going onstage in the movie. Here you will also find steps leading up to the top of Mönchsberg cliff. Address: Hofstallgasse 1. Guided Tour Cost: 7€. Guided Tour Hours: Varies by the month, please see their website here. Photo: (Exterior from the West). Sound Of Music Film Connection: Captain performs “Edelweiss” at the Rock Riding School and is joined on stage by his family for “So Long, Farewell” before escaping. Toscaninihof Square is where Captain waits before going on stage which is also feature is some other minor scenes in the movie. About Saint Peter’s Cemetery: The beautiful flower-filled cemetery of Saint Peter’s Church is where the Von Trapps hid from Nazis in The Sound of Music movie, although the scene was filmed in Hollywood. The cemetery’s peaceful grounds, which also has a waterfall, may just be the most serene location in all of Salzburg. This unique cemetery goes back to 700 AD with cliff-side catacombs that go back even further to 215 AD. The oldest headstone we have found is from 1288 AD. Among the graves are Mozart’s sister Maria Anna as well as Franz Wasner who was the real-life Max Detweiler from The Sound of Music movie. He served as the Von Trapp’s advisor and choir conductor. The most unusual thing about Saint Peter’s cemetery to us is that you do not buy the plots, but instead rent them. Relatives of the dead must pay rent for the plot every 10 years and must also be the caretakers. If your family doesn’t pay your rent, they toss your body out. This method does help ensure that every rod iron headstone you see will have an abundance of fresh flowers. If you making good time on this free Sound of Music film locations tour, make sure to check out inside of Saint Peter’s Church which has stunning murals lining its nave. Next door to the church is one of our favorite places to eat called Stiftskeller Restaurant which has nightly Mozart concerts and is considered to be Europe’s oldest restaurant. Emperor Charlemagne himself even ate here back in 803 AD. Hours: April-September 6:30am-7pm; October-March 6:30am-6pm. Cost: Cemetery is Free; Catacombs 1€ Adults, 0.60€ Children. Sound Of Music Movie Tour Connection: Saint Peter’s was the inspiration for the cemetery the Von Trapps used to hide from the Nazis in the movie, although the scene was filmed in Hollywood. The cemetery is home to the grave of Franz Wasner who was the real-life Max Detweiler. About Residenz Square & Fountain: Sitting on the site of a former ancient Roman Forum, Residenzplatz Square still shows off Salzburg’s early Italian ambitions. This large square is the filming location where the Von Trapp family performs ‘I Have Confidence in Me’ in The Sound of Music. Maria enters through the Domplatz arches on the Southwest corner of the Square and splashes in the 45 foot tall Horse Fountain (Residenzbrunnen). The Horse Fountain is the focal point of the busy Square and is complete with a Triton which matches Bernini’s famous Triton Fountain in Rome. Completed in 1661, it is the largest Baroque fountain located outside of Italy. People watching near the Horse Fountain is incredible as the Residenz Square is the center of everything Salzburg. There have been local painters setting up in Residenzplatz forever, and we have found that many of them take on fake Italian last names so they can charge higher rates for their work. On the Westside of the square is Old Residenz Palace (Alte Residenz) which has a Nazi flag draped over it in The Sound of Music. The palace built as a mansion for Salzburg’s Archbishop in 1596. Today the complex has elegant staterooms, which are lavishly decorated, plus a prestigious art gallery that has Rembrandts and Rubens. In 1602 the Archbishop built the New Residenz (Neugebäude) on the Eastside of the square to serve as his guest house. The building is home to the Glockenspiel Bell Tower, Heimatwerk Shop, and the Salzburg Panorama 1929 painted by Johann Michael Sattler. The Panorama boasts a series of stunning 360-degree panoramic paintings of many European cities made during the early 1800s. Sound Of Music Film Tour Connection: During the song “I Have Confidence in Me”, Maria splashes in the horse fountain and the Old Residenz also has a giant Nazi flag on its facade in the movie. About Mozart Footbridge: This pedestrian footbridge named after Salzburg’s most famous resident, Mozart, opened in 1903. In the Sound of Music, the Mozart Footbridge (Mozartsteg) is the scene where Maria and the kids skip across while pointing during the song ‘Do Re Mi’. Along the grassy riverbank, the children also skip along during the song “My Favorite Things”. For this free Sound of Music walking tour, we usually don’t fully cross the Mozart Footbridge as there is much more still to see on the Southside of the Salzach River, but feel free to do a few skips before moving on. If you do feel adventurous, the historic Steingasse & Kapuzinerberg Monastery, which are featured in our Old Town Salzburg Walking Tour, are only a short walk across the river. Sound Of Music Movie Tour Connection: Maria and the kids skip across while pointing during “Do Re Mi” and the grassy riverbank is in “My Favorite Things”. About The Nonnberg Convent: Sitting above the city, the historic Nonnberg Abbey (Stift Nonnberg) was founded by Saint Rupert in 714 AD. This longevity makes Nonnberg the oldest convent in the German-speaking world. Prior to the convent, the perched location was home to a small Roman fort dating back to the settlement Luvaum which is why Saint Rupert renamed the town Salzburg (Salt Fortress). The Nonnberg Convent’s abbey has been rebuilt a couple of times with the current one dating back to the 1400’s. The red onion dome on the abbey’s belltower is one of the most iconic architectural features in Salzburg. There were 4 great scenes film on the ground of the Nonnberg Convent in the Sound of Music movie near the abbey gates. These iconic scenes include Maria leaving the abbey while wondering “What will this day be like?”, the nuns talking about Maria, the children coming to visit, and the Nazis on the hunt for the Von Trapps during their escape. Fans of The Sound of Music movie will also remember the nuns singing the song ‘Maria’ at Nonnberg. Permission to film inside the convent was not allowed, so they had to re-create the interior film scenes at sets in both Hollywood and at a small studio in Salzburg. Nonnberg Abbey also happens to be the same Benedictine Convent that the real-life Maria lived for 2 years, taught at, and was married to Georg Von Trapp in 1927. The filming of Maria and Captain’s wedding scene for the movie, however, was at Collegiate Church in Mondsee Austria which is listed later on this Sound of Music movie locations walking tour. It is interesting to note that the real wedding (1927) actually took place 11 years before the Nazis came to Salzburg 1938. As you wind your way up the path to the Noonberg Abbey gates, you will follow Nonntaler Hauptstraße Street where the carriage scene at the start of “Do, Ri , Me” took place. Many visitors skip the trek up to the abbey, but we think it is worth the effort and a highlight of our Sound of Music walking tour. If you want to cheat a little, you can hike downhill to the Nonnberg Convent if visiting the Salzburg High Fortress. Abbey Website: Here. Sound Of Music Film Tour Connection: There are 4 scenes shot at the Abbey gates, and the nuns sing “Maria” inside, although the interior scenes were shot in a studio. The real-life Maria lived here for 2 years, she taught here, and was married here in 1927, which was actually 11 years before the Nazis arrived in Salzburg. About Palace Leopold: Beautifully reflecting over a small lake, Palace Leopold (Schloss Leopoldskron) served as the primary filming location in Salzburg for the scenes depicting the exterior of the Von Trapp family home in the Sound of Music. The Baroque Palace was built in 1736 by Salzburg’s Archbishop Leopold, was later owned by King Ludwig I, and offered the perfect backdrop to represent the Von Trapp’s stately manor. In addition to shots of the mansion overlooking the lake, all of the lake terrace scenes, where filmed here including the children falling out of the rowboat. The horse statues on the terrace’s gate are still as beautiful as when the movie was filmed. The Leopold Palace was the original home to the Sound of Music Gazebo from the movie which was later moved to Mirabell Palace. Like many other parts of the Sound of Music movie, the shots taking place inside the family home like the bedroom, ballroom, and staircase were actually all filmed on a studio set in California. A couple of outdoor scenes showing the gate and fence of the Von Trapp mansion in the Sound of Music were shot at Frohnburg Castle which is the next stop on our Sound of Music walking tour. The real-life Von Trapp Villa is also listed below and located only 1 mile away. Today the Schloss Leopoldskron is privately owned and operates as a boutique hotel. The terraces from the movie are only accessible to hotel guests, however, the most iconic view of the mansion is actually along the Westside of the lake looking back on the Palace reflecting in the water and is free to visit. If you are to book ahead, you should really consider staying overnight here just to say you did it. You may very well get a stay in a room where the previous owners Archbishop Leopold or King Ludwig I once slept. Since it sits just South of town, the mansion is the first filming location on our Sound of Music movie in Salzburg where you should consider turning your self-guided walking tour into a do-it-yourself bike tour. Getting To Palace Leopold: Unless you are staying overnight at the Palace you can’t visit the terrace but you can see it from a popular viewpoint across the water. You can walk here in about 25 minutes from either Nonnberg Abbey or from the heart of Old Town by taking the steps over Mönchsberg Hille from Toscaninihof Square. You can also take Bus 25 to the Seniorenheim Nonntal Bus Stop and walk a quarter mile to the West of the Palace near Han-Donnenberg Park. Biking here is also a great option which we prefer and taxi is a good backup. Staying Overnight: You can book a room through the Palace’s booking website for around 150€ a night. Tours: You usually have to be a guest of the hotel to get a tour or access to the terrace, however, you can stroll along most of the small lake and take photos of the exterior. Photo: (From Terrace At The Grounds). Sound Of Music Movie Tour Connection: Palace is used to depict the exterior of the Von Trapp home reflecting over the lake. The lake terrace scenes and Maria falling into the lake with the children also happen here. The Palace was the original home of the Gazebo during filming. All of the interior scenes were shots depicting the home were actually filmed in a Hollywood studio. About Frohnburg Palace: The Frohnburg Palace, built in 1660, is used as the backdrop for the Von Trapp family home in every scene that does not involve the lake. The most iconic feature you’ll recognize is the Von Trapp Mansion Gates where Maria arrives to meet the family while singing ‘I have Confidence’. Frohnburg Palace is also where the kids tried to quietly push the family car past the Nazis and where the Captain pulls down the Nazi flag from the gate after the couple’s honeymoon. The grounds of the mansion are now the Mozarteum Music Academy, but the gates and wall from the movie are both accessible right next to the road. If you are visiting Salzburg in July or August, you can stay here in the dorms here as the school is not in session for as cheap as 38 euros a night with a 3-night minimum. Getting Here: Take the Bus 25 route to the Kleingmain Hacksteinerweg Bus Stop and walk one long block East to Hellenbrunner Allee. Walking it is 35 minutes from both Palace Leopold and Old Town Salzburg or 20 minutes to the Sound of Music Pavillion at Hellbrunn Palace. Nearby: Schloss Herrnau is located just a short walk to the east and is one of our favorite private homes to photograph. Palace Website: Here. Summer Hotel Website: Here. Sound Of Music Film Locations Tour Connection: Used to depict the gates of the Von Trapp estate where Maria arrives to meet the children singing the song “I have Confidence”, the kids try to quietly push the family car through the gates, and where Captain tears down a Nazi flag after their honeymoon. A total of 5 scenes were shot here. 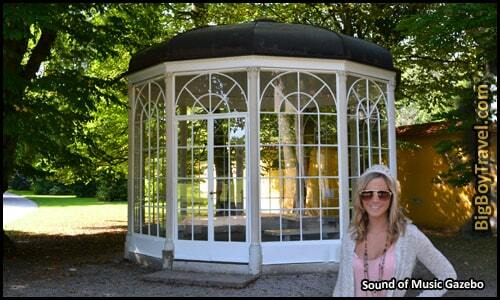 About The Sound of Music Pavilion: One of the most famous and romantic scenes of The Sound of Music was filmed in this timeless gazebo when Liesl sings ’16 going on 17′. Liesl badly twisted her ankle filming these scenes but was luckily able to tough it out. It is still one of the most romantic stops today on our Sound of Music movie tour. While the Pavilion is located at Hellbrunn Palace today, during the production the Gazebo was constructed at Leopold Palace. The public is not allowed inside the Gazebo, but you can still walk up to and dance around it. The pavilion is near the near the Eastern entrance to the Palace, but outside the walls so you don’t even need to pay the Hellbrunn entry fee to see it. Near the Gazebo is a large park filled with tons of flowers that locals like to visit to get out of Salzburg for a few hours. If you are making pretty good time on this Sound of Music walking tour you should consider visiting the Trick Fountains at Hellbrunn Palace. The fountains are only available as part of a guided tour but is a very memorable time. The tours last about an hour and take you through grottoes, ponds, and walkways all filled with trick fountains that are out to get you. If you have kids with you, the Hellbrunn Fountains will be the most fun thing they do in Salzburg. Your ticket for the Trick Fountains tour also lets you tour the inside of the Hellbrunn Palace itself which is pretty fancy and has some amazing ceilings. Meaning Mouth of The Spring, Hellbrunn Palace was built by Prince Archbishop Sittikus in 1613–19 as a daytime retreat on the site of an old hunting lodge from the 1400s. Like the trick fountains, the Hellbrunn Palace was really made for fun and was built with ZERO bedrooms. The vast wooded grounds of the estate were settled as early as 500BC and have had a large villa since Roman times. Getting To Hellbrunn Palace: Bus 25 from Old Town Salzburg stops right here (Fürstenweg) and it’s a 15-minute ride from Salzburg. Alternatively a 50-minute walk with limited sidewalks from both Old Town and Palace Leopold or 20 minutes from Frohnburg Palace. Bike rental is also a great option to see it all. Gazebo Hours: Daily Dawn-Dusk all year. Palace Hours: April, October, & November 9am-4:30pm; May, June, September 9am-5:30pm; July & August 9am-6pm. Trick Fountain Hours: The Trick Fountains have tours from 9am-9pm in the peak season but are closed for Winter from November-March. Cost: You can see the Gazebo for Free near the Eastern entrance to the Palace. Tours of the grounds included both the Palace interior and Trick Fountains of 10.50€ for Adults, 5€ for kids. Palace Website: Here. Sound Of Music Movie Tour Connection: Where Liesl and Rolf sing “16 going on 17” while dancing around. Maria and Captain also later sing “Something Good” in the Gazebo. Most interior scenes had to be filmed in a studio as the inside of the real Gazebo was too small. About The Von Trapp Villa: While not an actual Sound of Music filming location, this beautiful yellow mansion (built in 1863) was where the real Von Trapp family lived in from 1923 to 1938. The widowed George Von Trapp was able to acquire the mansion for himself and his 7 children after being granted baron statue for his valor in as a Captain in WW1. In 1926, Maria Kutchera was sent to the family home by the Nonnberg Convent to tutor Captain’s ill daughter Maria. One year later the couple married which was actually 11 years before the Nazis arrived in Austria. Georg Was 47 at the time they married and Maria was only 22. Maria and Captain had another 2 children of their own while living in the Von Trapp Villa. In 1936 the Von Trapps lost a lot of money in a bank crash, had to start renting out rooms in their home, and started to perform professionally as the Chamber Choir Trapp to make money. Within a year of the of the Nazis arriving the family used the train station in front of their mansion to escape to Italy, just 1 day before Hitler closed the Austrian borders. At the time they left Maria was pregnant with the couples 3rd child (Captain’s 10th), who was later born after the family reached America by boat. Until the end of the war, Hitler’s SS Guard stayed in the Von Trapp Villa. Georg Von Trapp died of lung cancer in Vermont in 1947, but Maria lived until 1987 and even had a cameo in the Sound of Music movie. In 2010, the Von Trapp Villa was renovated into a hotel which you can tour or stay in today. While you’ll probably want to use a bike to visit the Villa, it is worth a stop to work some real-life history into our Sound of Music movie tour in Salzburg. Getting To The Von Trapp Villa: The Villa is located directly next to the Salzburg Aigen train station creating easy access just a 10-minute ride from Salzburg Station on the way to Werfen. By Bike, it will take about 15 minutes from Old Town Salzburg and about 17 minutes from either Leopold Place or Mirabell Palace. Villa Tours: Tours are available daily at Noon with a reservation for 15€. Hotel Website: Here. Sound Of Music Film Locations Tour Connection: Was the real-life Von Trapp family mansion and across the road is the train stop they used to escape to Italy. 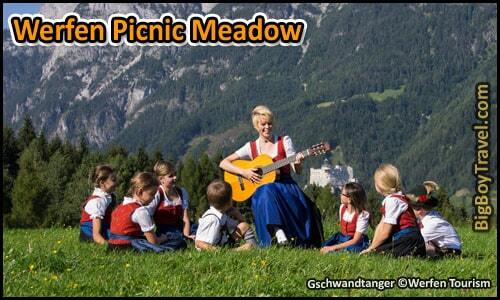 About The Werfen Picnic Meadow: Perched just above the village of Werfen is the Gschwandtanger Meadow where Maria and children have their picnic scene during the start of the song “Do Re Mi”. While you needed permission in the past to visit the farm meadow, the city of Werfen created an official Sound of Music Trail in 2015 to open it up to visitors. A short 1.4km hike brings you above the village where you can re-create the picnic scene for yourself. Make sure to take in the views of the valley and Hohenwerfen Castle below. The Fortress is the sister of Old Town Salzburg’s Hohensalzburg Castle and can be seen both in the picnic and the aerial shots of the Sound of Music’s opening scene. If you are looking to make your visit to Werfen a full day affair, make sure to tour the castle and also visit the World’s Largest Ice Cave sitting high above the city. You’ll have to start early to do both. Getting To Werfen: Trains run every 30 minutes between Salzburg and Werfen and the journey lasts just 45 minutes. A hiking path leads from the train station to the castle and another up the hill to the meadow. The ÖBB offers practical combo-tickets ‘With the train to Hohenwerfen Fortress’. More information is available here. Visiting In Winter: Bother the Sound of Music Meadow trail and the Werfen Ice Caves will be closed during the Winter months due to snow, but the Fortress is open all year. Sound Of Music Film Locations Tour Connection: The famous picnic scene where Maria and the kids first start the song “Do, Re, Mi”. About The Sound of Music Meadow: Made famous in the opening scene of The Sound of Music movie with a twirling Julie Andrews, this timeless meadow is where we learned that the ‘Hills are alive with the Sound of Music’. Officially called Mehlweg, the Julie Andrews meadow is only 12.5 miles south of Salzburg in Marktschellenberg, Germany. The birch trees in the movie were fake and other dressings were added artificially for the filming of the movie, but even stripped down the meadow is amazing. Although previously connected to a guesthouse, the property has been a private farm since 2010 and is no longer regularly accessible to visitors. Getting To The Sound Of Music Meadow: Although the Sound of Music Meadow is near the top of the Marktschellenbergiking trail and accessible by car/taxi it is now part of a private farm and not open to the public. You can thank visitors who repeated walked through the owner’s family garden and irritated their sheep for the lack of access. Respect their privacy and visit the Picnic Meadow in Werfen or the nearby hills in Berchtesgaden for the full Sound of Music Meadow experience. Sound Of Music Film Locations Tour Connection: Julie Andrews twirls around in circles during the opening scenes of the Sound of Music while singing “The Hills Are Alive With The Sound of Music”. About Roßfeld Mountain: The Alpine toll road that loops around Roßfeld Mountain East of Berchtesgaden Germany was used to depict the family’s climb to safety over nearby Untersberg Mountain at the end of the Sound of Music movie. While we love these iconic closing scenes of the movie with the family singing “Climb Every Mountain”, it wasn’t very accurate. For starters, the Von Trapp family escaped by train and not by climbing over nearby Untersberg Mountain in real life. The family lived right next to a train station and were quite lucky as the day after their train left for Italy, Hitler shut down the borders of Austria. Even if the family had tried to hike over Untersberg, it would have been 175 miles across the rugged Alps to Switzerland for safety. It also would have been hard to start the hike here as Hitler’s backup command center called the Eagles Nest is nearby. During the closing scenes of the Sound of Music movie, you can see the Eagles Nest and Purtschellerhaus hotel in the background. All of that being said about the film’s inaccuracies, this stretch of the Rossfeldstraße is still amazing to visit for drivers and the mountain is popular with skiers in the Winter. If you wish to visit the summit of the real Untersberg Mountain you can bus there easily from Salzburg and Berchtesgaden followed by a quick cable car ride. More adventurous visitors can also hike 2 hours from the summit to the Untersberg Mountain Ice Caves (Eishöehle) which is only ice cave in Germany. Keep in mind that there are other ice caves in Werfen and Hallstatt Austria that are way easier to get to. Getting To Roßfeld: The Alpine loop toll road around Roßfeld is best accessed by rental car or motorcycle. Getting From Here To Untersberg: Take bus 840, 25, or 28 to the village of St. Leopold then ride on the Untersbergbahn Alpine Lift Route to the top of the mountain if desired. The Ice Cave is a 2-4 hour hike out of the way from the Alpine Lift. Sound Of Music Movie Tour Connection: Roßfeld was used to depict the family’s escape over nearby Untersberg Mountain during the closing scenes with “Climb Every Mountain”. In real life they took a train to Italy and climbing this mountain would have put them right at Hitler’s backup command center the Eagles Nest. About The Wedding Church: Located 16 miles East of Salzburg, the Collegiate Church (Kollegienkirche) of Saint Micheal in Mondsee was the film location for Maria and Captain’s wedding in The Sound of Music movie. The actual wedding happened at Nonnberg Abbey in Salzburg in 1927, which was 11 years before the Nazis arrived in Austria. At the time of the real-life wedding, it’s also worth noting that Maria was only 22 and Georg Von Trapp was 47. Often called the Wedding Church or Mondsee Cathedral, this bright yellow church was the perfect fallback setting for the wedding after filming was not allowed inside Nonnberg Abbey. The filming of the wedding processional inside of the Collegiate Church was the only major indoor scene of the movie that was shot on location instead of in a studio. The 170-foot tall twin towers and beautiful pink interior are both awesome, but the Collegiate Church has a history also. The first church was established in Mondsee in 976AD and the current was built in 1487. In addition to the bright pink interior seen in the Sound of Music’s wedding processional, the Church is renown for its 7 side altars and the main Baroque altar which was made in 1626. In 2005, Pope John Paul II upgraded the spacious Collegiate Church Saint Michael from a Cathedral to a Basilica. Mondsee is a pretty small village but the quaint square in the center of town near the Church is very rewarding and offers easy access to take a nice lakefront stroll. As you head toward the lake, you’ll see the trees the children are hanging out of as Captain drives by with the Baroness and Max. Getting To Mondsee From Salzburg: Quickest way to get here is bus 140 which leaves every 40 minutes and only takes 53 minutes for the journey. Consider checking out the nearby cities of Saint Gilgen or Hallstatt if you are going this direction. Visiting Hours: Most days 9am-7am, optional donation suggested. Church Website: Here. Sound Of Music Film Locations Tour Connection: The Collegiate Church served as the film location of Maria and Captain’s wedding processional. It was the only major interior scene of the movie shot on location instead of a movie set. About Mondsee Lake: Mondsee is one of the many amazing lakes you can easily visit near Salzburg. Other favorite lakes of ours include Kings Lake in Berchtesgaden, Wolfgang See near Saint Gilgen, and Hallstatt See. Kings Lake, Obersee, & Fuschlsee are all seen in aerial shots in the opening scenes of the Sound of Music. As you head toward Mondsee Lake from the church you’ll see another spot from the movie, the trees the children are hanging out of as Captain drives by with the Baroness and Max. Further along the Eastern edge of Mondsee, you’ll find one of best Sound of Music film locations where the Maria and the kids ride bikes during “Do, Re, Mi”. As the children bike around Lake Mondsee, you can see the Zwölferhorn Mountain visible across the water. When you picture a Sound of Music bike tour, the path around Mondsee is by far the most iconic route to pedal. Getting To The Mondsee Lake Bike Scene Location: From Mondsee, you can either bike to the other side of the lake in 6 miles or take Bus 596 from the bus station to the Innerschwand/Mondsee Niedersee Stop in about 20 minutes, but the bus only leaves every 2 hours. Sound Of Music Film Locations Tour Connection: Where the kids hang from the row of trees as Captian’s car drives by and where they ride bikes with Maria along the water during the song “Do, Re, Mi”. 2. Panorama Tours: Panorama Tours is more of the traditional larger tour bus style tours with a commercial feel. This tour covers pretty much the same sights as Bob’s Tours 4 Hour Tour, and although it’s not as personal, it is a great sure fire tour. Hours: Leaves at 9:30am & 2pm. Cost: Adults are €40 and children are €40. Has a hotel package deals that include a room, breakfast and 4 Hour Tour which ranges in price from €135 to €200 per person. 3. Maria’s Bike Tours: We love Maria’s Bike Tours! Their tours do the best job of letting you experience the Sound of Music instead of just seeing it through a window of a van or bus. People of all ages like this tour because although it is a bike tour, it doesn’t require you to be super in shape. The biggest advantage is that it has an afternoon tour while most of the SOM tours only depart at 9am. Did we mention, they provide the bikes and helmets? Meeting Point: Mirabell Palace Entrance. Hours: Leaves daily at 930am and runs from May 1st-Sept 31st; 430pm tour starts in June; reservations required June & August. Cost: Adults €24, Ages 10-15 €15, Children 10 and under €10; bike is included for free and you can rent it for the duration of the day for €8.